If you are chomping at the bit for the new ski season, then you'll be delighted to hear that ViewRanger users can once again access and use ski resort maps as one of our free global web maps. 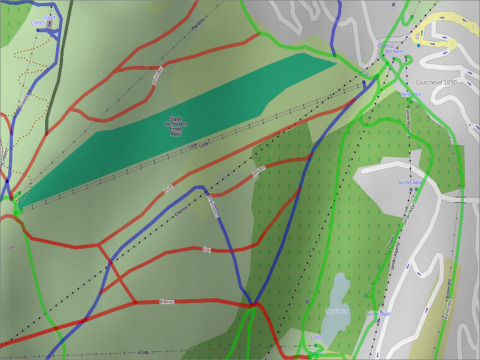 The Ski maps we offer are based on OpenPisteMap which is a global open sourced map layer that includes ski information including colour coded ski runs and lifts, for hundreds of ski resorts around the world. And because ski maps can be stored in advance on your phone they can be viewed with or without mobile signal and therefore avoiding roaming charges. Once stored on your phone, Ski maps will allow you to view your real-time mapped location, find ski runs and lift locations. And as it can also be viewed via My.ViewRanger on the web, you can even use it to plot routes and lunch stops for longer days out. To view the map, you need to update your maps list in-app (data connection required). To update, close the app, restart and go in to Organiser > Maps > Online Maps and let the list update. (On iPhone, the Ski map may be listed under Maps rather than under Online maps.) Select the Ski map (towards the bottom of the list) to see a preview, then choose View or View map. The map covers the whole world (using standard street map), so pan and zoom to your resort, or search for a place name. To store, use the "create saved map" function. You can use our BuddyBeacon location sharing feature to view the location of other members of your group on your phone (requires data connection). Our Track recording & TripView sports computer mode will also let you keep a record of your exploits and view stats for extra après-ski bragging rights. If your Winter trips are taking you beyond prepared ski runs or you'd like to have additional topographic map detail, then it's easy to install Premium mapping for many mountain areas in Europe including those in France, Switzerland, Austria, Germany, Italy, Spain, Sweden, Norway, Finland and Czech Republic, as well as for USA and Canada. Follow the links to find out more.